Friends and neighbors, this is no ordinary winter. Our social media feeds and newspaper headlines continue to lend themselves to a palpable sense of futility that seems to hang around us like this season’s relentless chill. Despite how cozy and warm and protected we feel on our quiet corner in Ballard, even we can admit that the last few weeks have felt a little bit heavy – to say the least. Many of you, and a good number of us, have spent the better part of this month and last marching, organizing, and raising our voices to various instances of injustice and oppression. The Womxn’s March. Standing Rock. The Muslim Ban. Myriad troubling Executive Orders. All of these things and more have been resting heavily in our hearts and minds; we know they’ve been on your mind too. The Brimmer & Heeltap brunch crew holding it down at the restaurant during the Womxn's March last month. We’re reminded, now more than ever, that a restaurant can provide a much-needed sense of whimsy and comfort when the “real world” just beyond our front door feels anything but. With the sip of a cocktail, the first bite of a delicious plate of food, a friendly greeting from a server you’ve come to know by name - all of the world’s troubles seem to dissolve, if only for that fleeting moment. We are so glad to offer our space as a refuge to you when you are feeling frustrated, angry, or sad. Since the very first day Brimmer & Heeltap opened we have aspired to be the kind of place that you look forward to escaping to at day’s end, a place you can stop in to and always feel welcomed and comforted. We can't wait to share Chef's latest creations with you. To that end, we are looking to springtime and the beautiful sense of renewal it evokes for inspiration at the restaurant these days. Chef Mike Whisenhunt is playing with fresh, vibrant flavors in the kitchen; you should see the way his eyes light up when he talks about nettle season! Proprietress Jen Doak happily arranged fresh flowers – the first of the season – throughout the dining room earlier this month, marking a dreamy transition to the warmer, sunnier days that lie ahead. Our wonderful bar manager Brian Hibbard is playing with flavors that are bright and playful; the Salt Bae is a new-to-the-list cocktail made with bourbon, mescal, Genepy des Alpes, apple shrub and salt that sings on the palate. Brimmer & Heeltap's exceptional lead server Heather Padella Dziedzic is helping our team select thoughtful wines to complement the changing menu, many of which are new to our list. 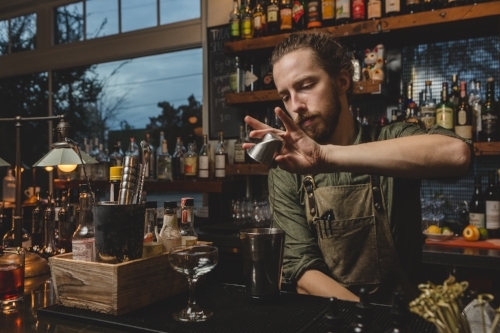 We can't get enough of the drinks bartender Brian Hibbard has been concocting lately! Brimmer & Heeltap lead server Heather Padella Dziedzic provides exceptional hospitality and guidance to our team. We have delighted in your visits to the restaurant during this strange, dark season. Serving you – our neighbors and friends – and offering our space as a safe haven is our sincerest pleasure; it cannot be overstated that a huge part of why we love what we do is because of the exceptional people we get to interact with so intimately and so often. We look forward to sharing more flavors, libations, laughs and warm embraces with you soon.